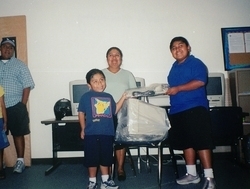 Periodically FSS receives donations of computers from companies, local businesses, and individuals. 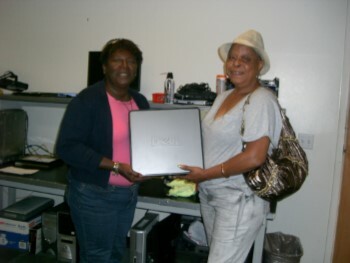 To benefit individuals and families participating in our programs, and other community organizations, FSS redeploys useful PCs back into the community. 1. Learn & Earn Classes - Use of donated systems as part of computer training classes. Individuals may be given a computer at the completion of a class. 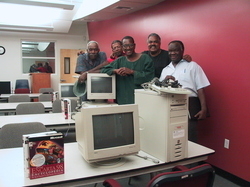 In summer of 2009, adult students in our Introduction to Open Source Free and Software received a computer system loaded with the Linux Ubuntu OS. The students not only learned about FOSS, but installed the software on their own systems. 2. FSS students also submit letter requests for computer donations. Their letter must not only explain reason for the request, but also address how h/she use their new skills and tool to benefit others. When possible, these requests are met. FSS has as a goal to create a community-based technical training and support program for local residents, where 1) donated computers can be refurbished and redeployed 2) local residents can receive troubleshooting and technical support, and 3) opportunities for technology-based self-employment/job creation can be realized. We are seeking individuals, companies, and foundations to invest in this effort. If you are interested, contact us and share this vision with others.